WHERE: The Jewish Heritage Museum is located in the Mounts Corner Shopping Center, at 310 Mounts Corner Drive Freehold, NJ, at the corner of Route 537 and Wemrock Road (between the CentraState Medical Center and Freehold Raceway Mall). It is on the second floor of the historic Levi Solomon Barn. For more information or to make a paid reservation (non-refundable), call the Museum at 732-252-6990, or visit www.jhmomc.org. The films to be presented are all in black and white, and set in Yiddish with English subtitles. Mamale, will be shown on Sunday, January 28. 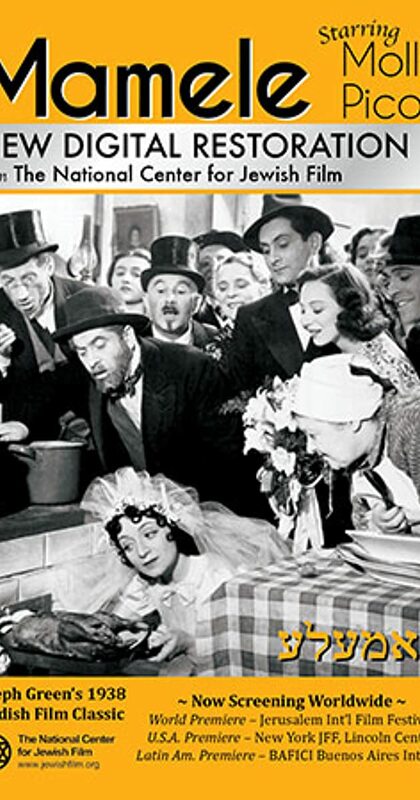 Directed by Joseph Green & Konrad Tom, Mamale (1938) features Molly Picon, “Queen of the Yiddish Musical,” who shines as Mamale (little mother), the dutiful daughter keeping her family intact after the death of their mother. She’s so busy cooking, cleaning and matchmaking for her brothers and sisters that she has little time for herself - until she discovers the violinist across the courtyard! Set in Lodz, this musical comedy/drama featuring Picon’s trademark song Abi Gezunt, embraces the diverse gamut of interwar Jewish life in Poland, with its no-goodnicks and unemployed, nightclubs and gangsters, and religious Jews celebrating Succoth. New York-born Yiddish icon Molly Picon entertained theater, radio, TV and film audiences for over seven decades (from age 6) with her song-and-dance routines while helping to popularize the Yiddish culture into the American mainstream as well as overseas. Raised in Philadelphia, she was performing from age 5 but broke into the big time with a vaudeville act called "The Four Seasons" in 1919, eventually making a comedy name for herself in the Second Avenue Theatres on the Lower East Side back in New York. She was cast as a Yiddish Cinderella in Mamele (1938), the last Jewish film made in Poland. During one musical vignette, Picon portrays her character's grandmother in several stages of life. Such amusing, unflappable film roles would also be found in Come Blow Your Horn (1963) as an interfering Italian mother, and Fiddler on the Roof (1971) as Yente the matchmaker. The Cantor’s Son (Dem Khazns Zundyl) to be shown on Sunday, February 11, was directed by Ilya Motyleff (& Sidney Goldin, uncredited). The film is an American Yiddish feature film, shot near the Pocono Mountains in Pennsylvania. It features the screen debut of singer, actor, and cantor Moishe Oysher in the title role of a wayward youth who makes his way from his Polish shtetl to New York’s Lower East Side. The film includes glimpses of the Lower East Side and the 2nd Avenue Yiddish theater marquees of the period. While washing floors in a nightclub, he is “discovered” and becomes a well-known singer. Ultimately, Oysher’s character returns home to the Old County and reunites with his parents and his childhood sweetheart. Moishe Oysher born in 1906 in Lipkon (Lipcani), Bessarabia, Imperial Russia, and died November 27, 1958 in New Rochelle, New York was an American cantor and Yiddish theater actor. He is considered one of the most entertaining chanzanim (cantors) ever recorded. Some say that Oysher's voice was like the "roaring of the lion." He liked the jazz style, popular at that time, and he used similar rhythmic melodies in his prayers, respecting always the traditional Bessarabian "Doinas" and "Nussach" moods of the prayers. Oysher starred in three Yiddish films. In 1943 Oysher signed a contract with Fortune Gallo to perform several roles with the Chicago Opera Company and a fine career was foreseen, but after a heart attack he had to abandon the idea; he continued to work in radio and as a chazan and recording artist until, after other heart attacks, on the advice of his doctors, he entered semi-retirement. The Light Ahead (Fishke der Krumer) will be shown in Sunday, March 11. Produced & directed by Edgar G. Ulmer, this American film made in 1939 tells the tale of impoverished and disabled lovers Fishke and Hodel dream of life in the big city of Odessa, free from the poverty and stifling old-world prejudices of the shtetl. The benevolent and enlightened bookseller Mendele helps them, turning small-town superstitions to their advantage. The Light Ahead is at once romantic, expressionist, and painfully conscious of the danger about to engulf European Jews. The JHMOMC is a tax-exempt organization under Section 501 (c)(3) of the Internal Revenue Code. The Museum is handicapped and assisted listening accessible. Special Valentine "Show-mance" Offer from NJPAC! The New Year Brings New UCPAC Discounts! Circle Players presents "Terra Nova"
Create a Great New Year—Enroll in a HAM Class!